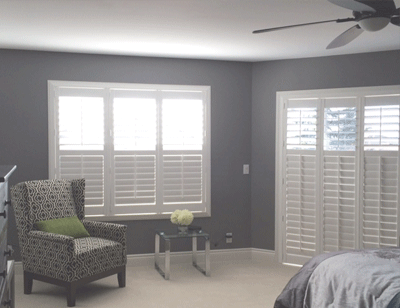 Sheila’s Window Toppers has been offering Calgary the best made shutters available on the market. They are the most durable, pet friendly, child safe, affordable, energy efficient, and has a long life span with a 25 Year Warranty. People have told us time and time again, that other shutter manufactures do not stand up to the quality of Shade-O-Matic because they tend to warp and break shortly after installation. With our extensive experience in the Calgary Shutter market, we strongly recommend only using this brand for your Polysatin Shutters. Custom made shutters will transform an ordinary window into an ever-changing source of light and shadow, beautifying any room. There are several types and styles of shutters and frames to select from depending on your budget and needs. Sheila has many years of experience and a vast knowledge of information about the shutters that Sheila’s Window Toppers & More carries. This product is a specialized item and should be measured, configured and installed by a professional to insure a beautiful fit and custom look. Contact Sheila at 547-4013, or drop into our Showroom with your measurements if you would like to know what the price of shutters would be for your windows or e-mail your measurements. E-mail Sheila and staff. If you would like to place the order, you can book an appointment to have your windows measured and the window configured. 38% of the window coverings we sell are polysatin Shutters! Learn more about Polysatin Shutters. What You Can’t See is Important Too! Shade-O-Matic Polysatin Shutters with Duralux matte finish have a clean, modern look that other shutters just can’t match. Known for high UV-Protection and won’t get warped with moisture, crack in heat, or discolour by sunlight. And because these shutters have the Duralux matte finish, they will never need refinishing. Perfect product for arches and specialty shaped windows.